It's starting to look a lot like fall in these parts. The leaves are turning beautiful colors, there's a nip in the air, and my deck is covered in acorns. Short of the annoying acorn covered deck, I don't think anything is prettier than the Midwest in autumn. I've begrudgingly let go of summer and have finally embraced the fall season, even diving into making my first pumpkin recipe of the year. I've been tempted by those massive pumpkin pies at Costco, but the husband and daughter have nixed getting one every time we are in there (boooo! on them!) 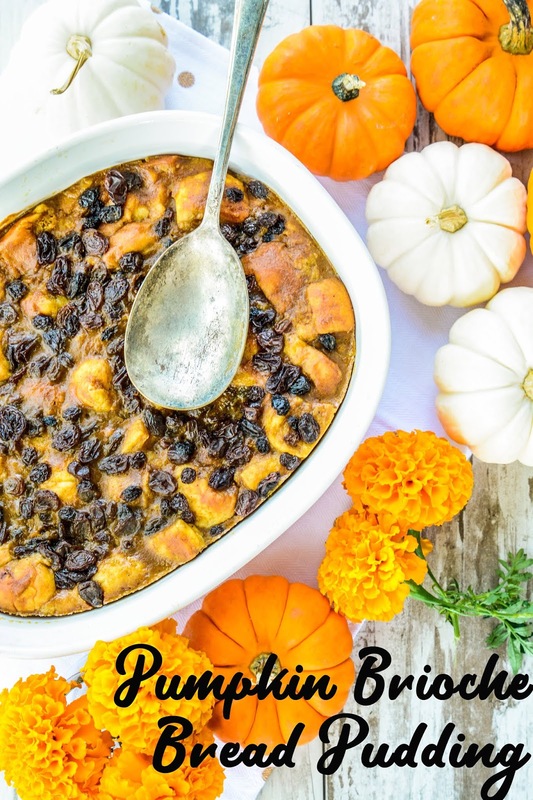 But, I needed a little pumpkin fix last week so I headed into my own kitchen and made a pumpkin brioche bread pudding. 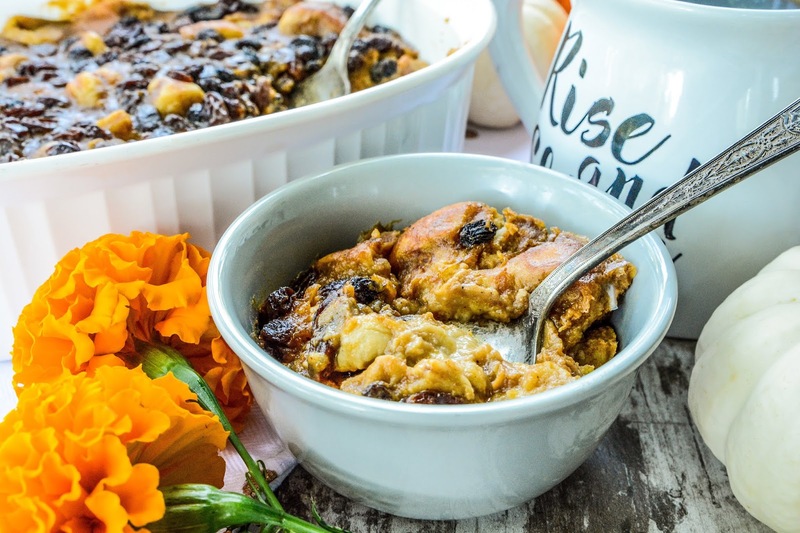 Warm bread pudding is such a welcoming comfort food this time of year, it's hard to resist a heaping bowl full fresh out of the oven. While it's meant to be a dessert, I admit, I've eaten it as breakfast a time or two. Served with a steaming mug of tea, I can't think of a sweeter way to start the day. For this recipe I used brioche, which gives it a rich and tender crumb. I bought day old brioche rolls at Target on clearance, which I find is a great resource for marked down breads. If you can't find brioche, any French bread will work for this recipe just fine. Butter a 9x9 inch baking dish. Place the raisins in a small bowl and cover with the apple juice and hot water. Let soak until plump, about 20 minutes. Drain and set aside. Spread the cubed bread on a baking sheet. Bake at 325 degrees until lightly toasted (5 to 10 minutes). Remove from oven and let cool. In a large bowl, whisk together the eggs, sugar, milk, vanilla, cinnamon, ginger, allspice and salt. Add the pumpkin puree and stir until well cmbined. Toss in the toasted bread cubes and stir gently, until the bread is evenly coated. Let the pudding mixture sit for 15 minutes, stirring gently occasionally, until the bread is well moistened and most of the liquid has been absorbed. Fold in the drained raisins, then pour the mixture into a the prepared baking dish. Place baking dish in a roasting pan. Pour hot water into the roasting pan until it reaches halfway up the sides of the baking dish. Transfer the pans to the center rack of the oven. Bake until the custard has set in the center and the top is golden, around 55 to 60 minutes. The center should be firm and the surface dry to the touch. Insert a toothpick into the center, and if it comes out clean, it's done. If the surface is browning quickly, lightly cover with a sheet of aluminum foil. 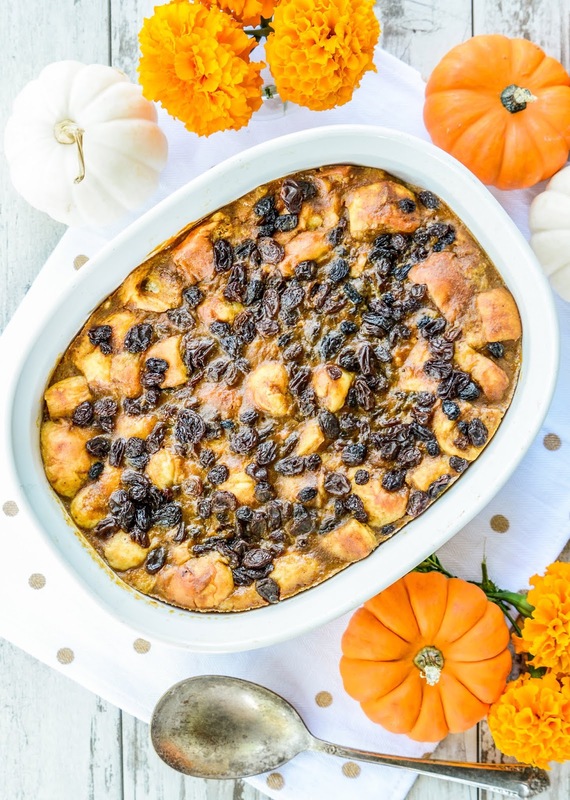 Remove from the oven and transfer the bread pudding pan to a wire rack to cool, roughly 20 minutes, before serving. Dust with powdered sugar if desired. 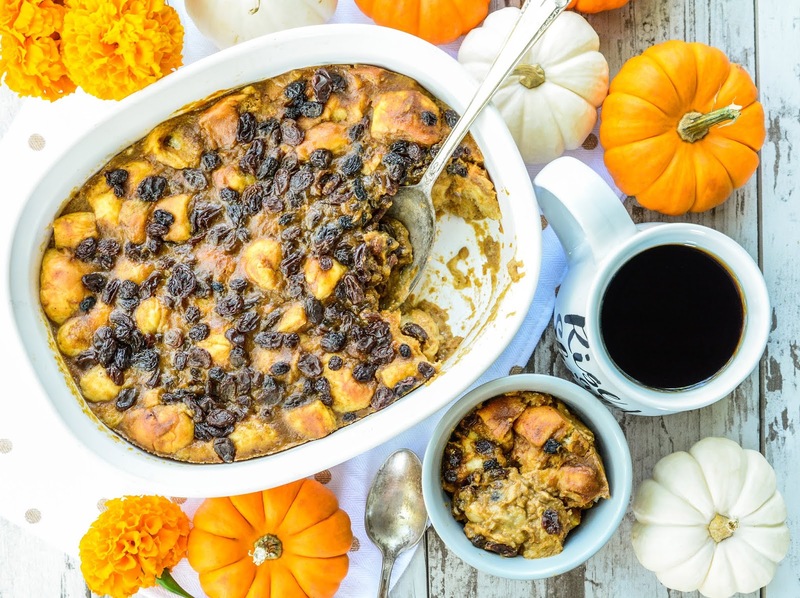 This pumpkin brioche bread pudding tastes best warm out of the oven, but can be served chilled as well. Keep refrigerated in an airtight container for up to 2 days. Have you made any pumpkin recipes yet this season? those lil' pumpkins are adorable, such lovely heralds of Golden Autumn. We're currently experiencing a rather hot week for Autumn, but the nights are nice and cold, but not 3*C like last month. I've made pumpkin soup for moi today. Just chives, cooking cream and vegeta and parsley with, garlic roasted and then mashed, pumpkins. It was quite chilly last week. Broke out my winter coat. This week I have the air back on again because it's really hot. The leaves have barely begun to fall from the trees, so I suspect we're in for a few more weeks of summer weather. At least I can hope we are. I made pumpkin soup last week. It was a honey recipe, so I'll be sharing it on Friday. Tried finding me some of those cute pumpkin bowls you had on Facebook, but couldn't find them locally. If this doesn't scream fall then I don't know what does! I can't wait to make this. I may not go in for pumpkin spice everything, but I DO love almost any baked thing involving pumpkin. I've made a pumpkin smoothie. It's good! I haven't made a pudding from scratch, since I was in high school. I'm thinking it's time to give it a shot. I'd probably divide the recipe in 1/2 - not knowing how my boys will or will not like it. I think halving it is a good idea when you aren't sure who will be eating it. I made this and since Allison does not like pumpkin flavored anything, it was just me and Jason eating it. A bit much for 2 people, but I did dig in and eat more than my fair share. This looks and sounds delicious. And it also seems nutrition enough to have for breakfast to start the day on a very positive note! Thanks for this recipe! Sure a win when you can have it for breakfast too. Who needs to buy a pumpkin buy at Costco every time with that. I'm still getting me a Costco pie before the year is up. Even if I have to host Thanksgiving this year, I'm getting me a pie. Oh, I love bread pudding. I just had pecan praline bread pudding this weekend. Now I need to try pumpkin bread pudding too. Ooh, pecan praline bread pudding sounds heavenly. I'm gonna have to make that asap! No pumpkin or pumpkin spice for me. This is a different spin on a pumpkin recipe. My friend was looking for more creative ways to use pumpkins when she goes pumpkin picking soon. This looks really AHHHmazing! Can't wait to give this a try! Not a single pumpkin recipe has been made. I think I mentioned earlier, that until Marching Band Season is over, not a whole lot of cooking or baking will be done. LOL! It's soooooo time consuming. 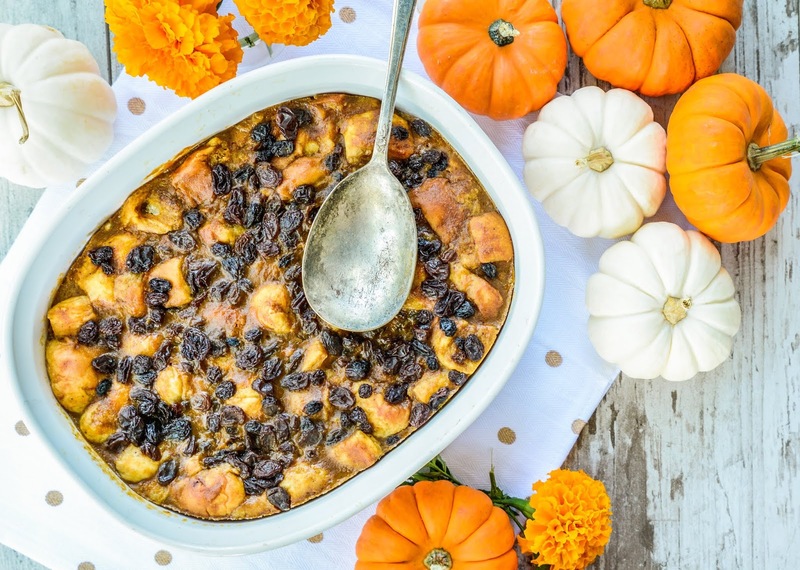 I love brioche for its soft texture..and this pumpkin pudding is even better with it! I haven't made anything pumpkin yet, but we did go trick-or-treating last weekend at an event. :) I had bread pudding coffee a couple of season ago that was SO good. I have never had the real thing though!! It sounds really delish.